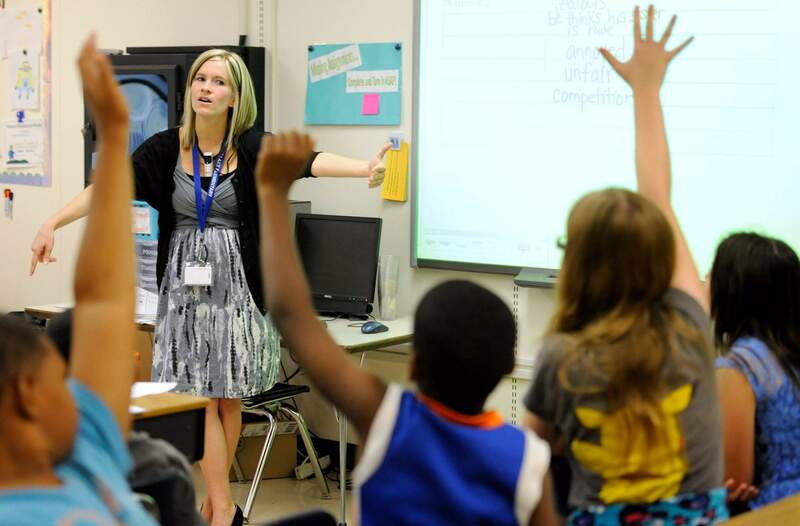 For Amy Lawson, a fifth-grade teacher at Silver Lake Elementary School in Middletown, Del., teaching an art lesson, her school has begun implementing the national Common Core State Standards for academics. Field tests for two main assessments, which were created to be based on the standards, will begin this week for 4 million students in 36 states and the District of Columbia. WASHINGTON – What’s on the new Common Core-based exams? More than 4 million kids in U.S. schools soon will have a clue. Field testing begins this week in 36 states and the District of Columbia on assessments developed by two different groups of states. Participating students will be asked to sit for hours in front of a computer or use a No. 2 pencil to answer questions. But there’s no need for kids to worry. The scores won’t count – this time. The actual exam-testing won’t be used for another year. The Common Core standards spell out what math and English skills students should have at each grade and are designed to develop more critical thinking skills than traditional schoolwork. They were first pushed by governors concerned about the large number of high school graduates needing remedial college help and lacking basic skills. Most states have adopted them. The field tests, to be conducted until June, are a big step forward in the push to more fully integrate the new academic standards into the school environment. They will give education officials a chance to judge things such as the quality of each test question and the technical capabilities of schools to administer the tests, which are computer-based but also will be available on paper. Indiana lawmakers, for example, last year paused implementation of the standards and a measure ending the state’s participation is at the governor’s desk. House lawmakers in Tennessee passed legislation delaying implementation – and testing – under Common Core for two years, but that proposal hasn’t been taken up in the Senate. Common Core supporters hope the field tests provide an opportunity to highlight the best of it. “There’s been a lot of talk and a lot of planning, and it’s actually happening, which I think generates some excitement and some reality, if you will, for the fact that this is moving ahead,” said Jeffrey Nellhaus, director of research, policy and design with the consortium Partnership for Assessment of Readiness for College and Careers, or PARCC. “We have a saying in Smarter Balanced that if nothing goes wrong in the field test, then actually we have failed,” Willhoft said. While opposition to the standards has been multi-dimensional, some critics take issue with the tests and how the results will be used because the tests are designed to replace the annual assessments given in states. Also complicating matters are the new teacher evaluation systems rolling out in many states relying, in part, on student performance on annual exams. Questions have been raised about when or if the Common Core-based assessments should count on these evaluations. Supporters are warning scores on the new assessments will drop compared with the old tests, but they say they will be a more accurate measurement of student knowledge. From the Partnership for Assessment of Readiness for College and Careers (PARCC): Arizona, Arkansas, Colorado, District of Columbia, Illinois, Louisiana , Mississippi, New Jersey, New Mexico, New York, Maryland, Massachusetts, Ohio, Rhode Island and Tennessee. From the Smarter Balanced Assessment Consortium: California, Connecticut, Delaware, Hawaii, Idaho, Iowa, Maine, Michigan, Missouri, Montana, Nevada, New Hampshire, North Carolina , North Dakota, South Carolina, South Dakota, Oregon, Vermont, Washington, West Virginia, Wisconsin and Wyoming.